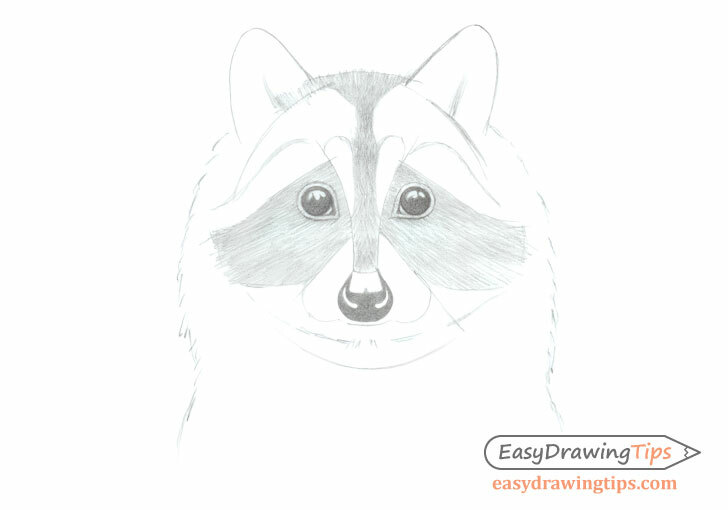 This step by step tutorial shows how to draw a raccoon’s face from the front view going from a basic sketch to a fully shaded realistic looking drawing. 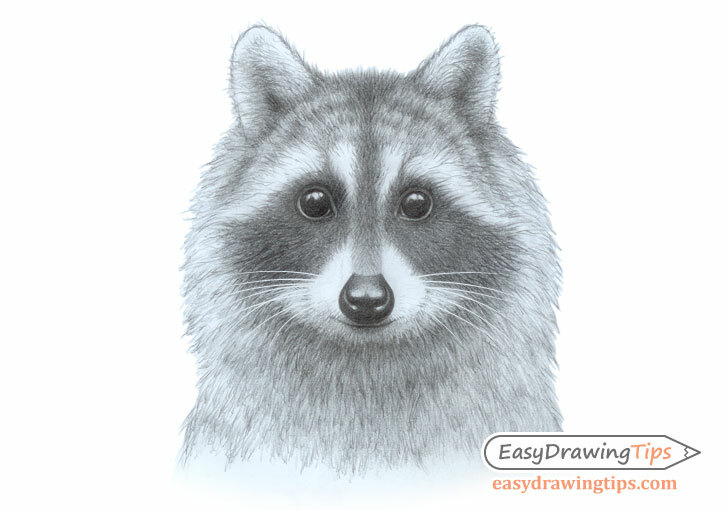 Before drawing any animal its a good idea to take a look at their most defining feature. A raccoon’s face has a very characteristic pattern with dark fur around the eyes that transitions towards the fur on their cheeks. Raccoons also have a fairly pointy snout, fluffy fur and ears that point upwards and slightly to the sides. Start the drawing with a highly simplified construction line sketch as in the above example. Be sure to draw very light lines that you can easily erase later. The goal is to create a sort of “framework” within which you will then draw and shade. 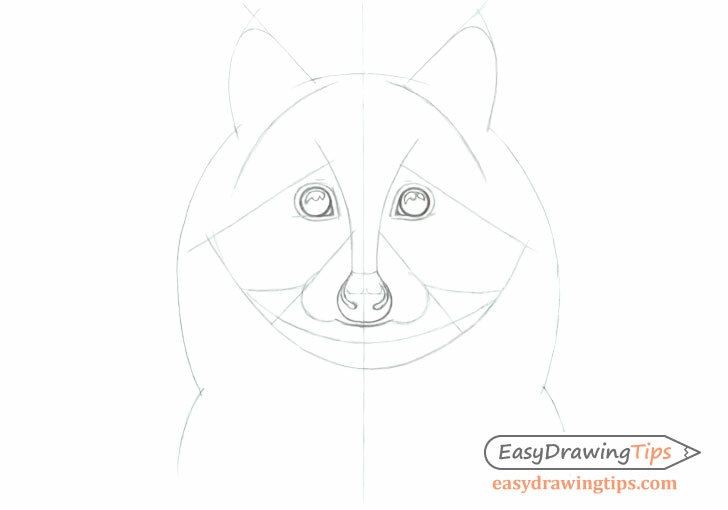 The very first line you will want to draw is the center line that will help make sure that both halves of the raccoon’s face are relatively even in width (does not have to be perfect). 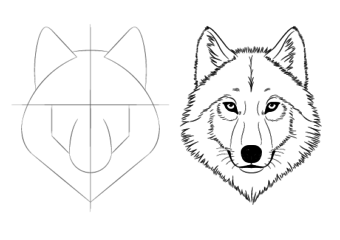 Next draw the outer curve of the head followed by the shapes of the ears and the inner shapes. As mentioned in the previous step inside the of the construction lien framework draw some of the smaller details of the head such as the eyes, mouth, and nose. You can also round off the ears and indicate the chin. Raccoons generally have large pupils that cover the major visible area of the eyes so you can simply draw them as a set of circles. You can then add a pair of “pointy areas” at the inner bottom ends of each eye. Inside the eyes outline the highlight areas so you don’t accidentally go over them when shading. Next you can outline the combined shapes of the circles and the pointy inner ends to create the eyelids. Draw the nostrils curving upwards and then inwards. In this case (as you will see in later steps) the upper nose area will also have a highlight so indicate it’s shape with a few light lines as well. 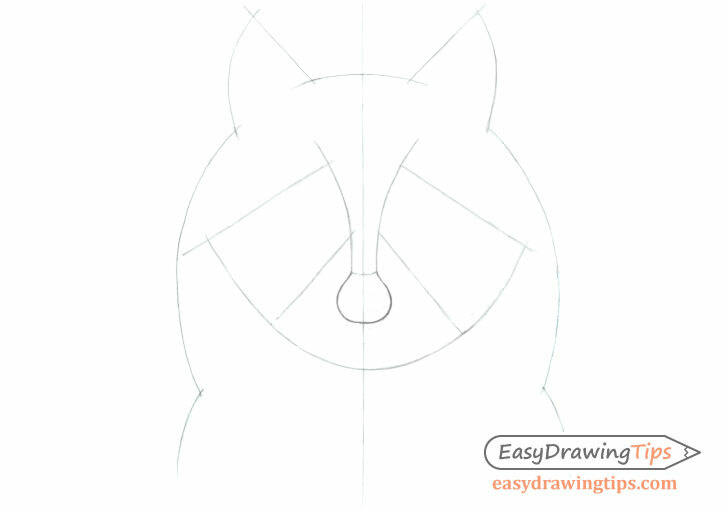 Draw the mouth with a small curve and add two shapes close to half circles to each side to help define the snout. You may notice that this line drawing still looks fairly abstract but there is no need to refine it further as we will do that with shading in the next three steps. Start the shading process by first filling in the eyes and the nose. Leave the highlight areas white. 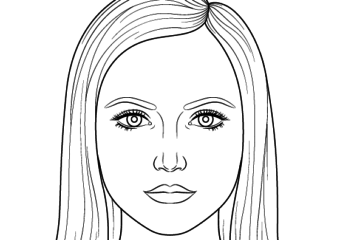 In this case the inner nostril areas will also have highlights so leave those white as well. 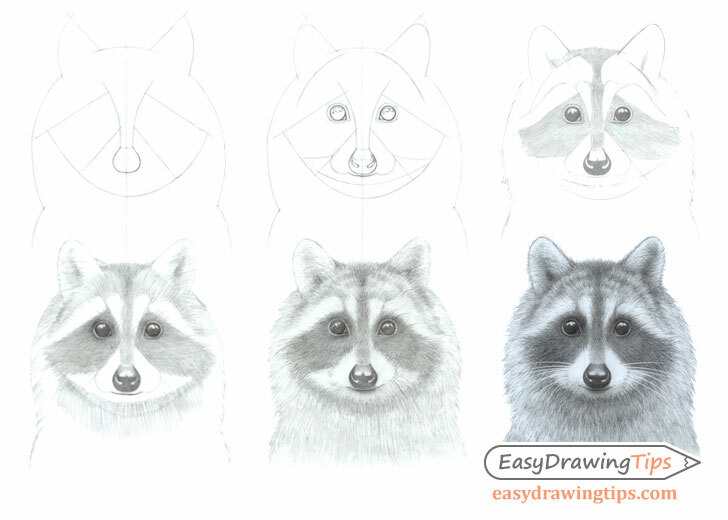 Next apply some basic strokes to the darker parts of the raccoons fur such as the areas around the eyes and the middle of the face. Try and make the strokes in the general direction of the fur. For this tutorial we are using very generalized lighting conditions shading the areas that generally tend to be in the shadows in most normal lighting with light coming from above. 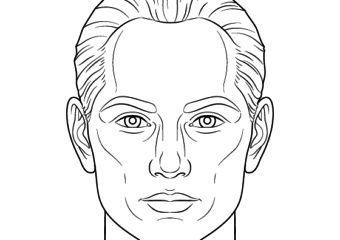 In this case the main “in shadow” areas will be below the chin and inside the ears. Shade this areas with darker strokes but not as dark as the black fur. You can also add some small fur patterns on the top of the raccoon’s head which will be about as dark as some of “in shadow” areas. Now finally apply strokes to the lighter areas of the raccoon’s head excluding the completely white areas of the fur. Again make the strokes in the direction of the fur. You can also start refining the shading on the darkest parts of the fur by adding some small strokes that more closely mimic the look of actual fur. 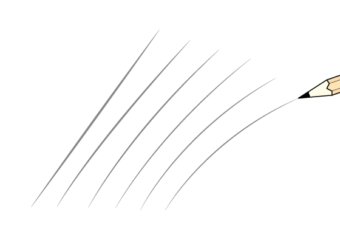 Try and make the strokes thicker towards the base and narrower towards the tips so they look like individual hairs. 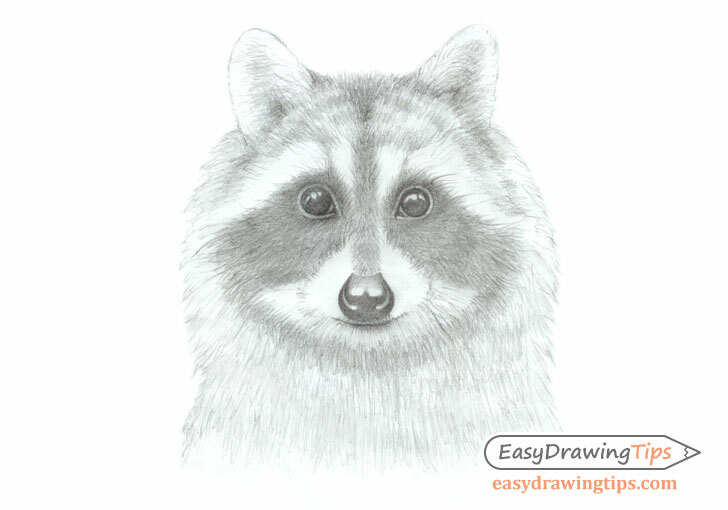 This final stage will take some work as you will need to do a lot of little strokes in order to imitate the raccoon’s fur. You should also apply the stroke in a way that creates fairly smooth gradient’s from light to dark where appropriate. Overall you will want to darken the shading but at the same time to be careful not to overdo it to the point where you can’t see the individual strokes that create the fur pattern. As you shade also be sure to compare the different areas of the drawing to one another to insure you have enough contrast. One thing that you may notice is missing form the first drawing are the whiskers. 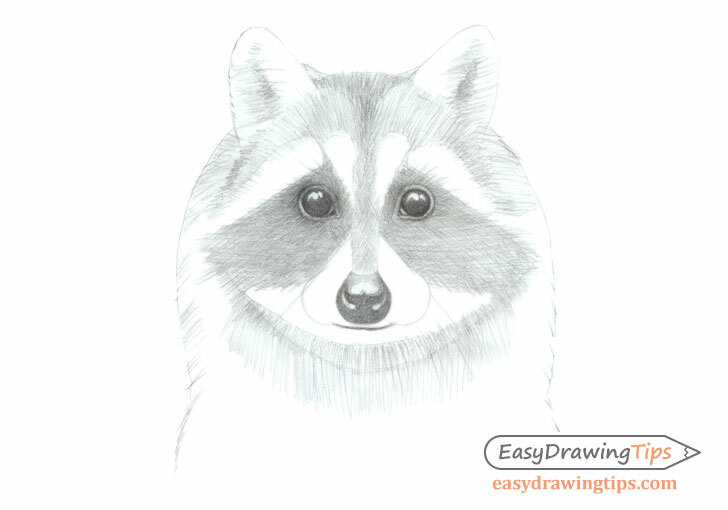 The reason for that is that raccoons have white whiskers making it very difficult to add them in a pencil drawing. You could try and leave the area white but that would make shading the surrounding area very difficult and even more time consuming as you would have to very carefully shade around them. A better option is to add the whiskers in after you finish shading either using white paint or certain types of pencil crayons. You can also scan your drawing and add them in digitally if that’s an option that’s available to you. Alternatively you can leave them out all together.